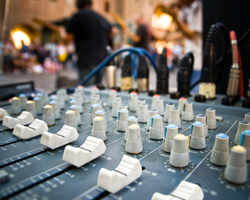 Adventures of Sound Tech Guy: Analog Mixing Consoles - Still Relevent? In the pro audio world, digital mixing consoles are becoming commonplace while many sound companies are ditching the older, classic analog boards. Do you believe that analog mixing consoles are still relevent amoungst all the new digital boards? Personally, I still like to use analog mixing consoles for my gigs. I messed around with a digital console and I didn't really get into it that well. That doesn't mean I will never use a digital console. I think what I need to do is to try out some different boards from different manufacturers to see which one fits! With the pro sound companies using digital consoles on major tours, many of the older, analog consoles are up for sale on the net. For example, I just saw an ad for an older Soundcraft Vienna II 40 x 8 mixing console. Asking price is $4500.00. Original purchase price was $55,000.00!!! That is a real steal of a deal for a console that will probably outlast many of the newer digital boards. A fellow sound tech friend of mine bought a digital mixer and he likes it because, it has everything built right in. No need to bring the FOH rack out anymore. Also makes for a quicker load-in/setup/teardown during the show. Okay, fellow sound technicians. I invite you all to voice your opinions on this subject. I am curious to get the low down.